10 to 20 degrees above normal for this time of the year. 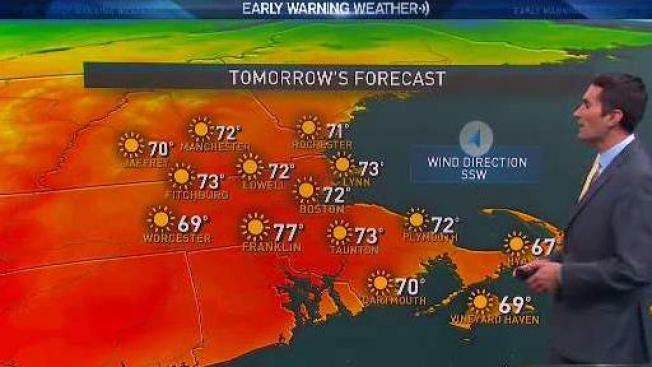 The biggest weather headline unquestionably is the incredible weather that will bring sunshine and warmth – some 10 to 20 degrees above normal for this time of the year with highs around 70 Friday and well into the 70s Saturday and Sunday. Although some wispy clouds will drift overhead Sunday, there will be abundant sunshine all weekend. Of course, the persistent dry weather now has pushed Southern New England and coastal Maine back into drought, and brush fire danger will remain elevated, particularly with an active breeze Friday. Clear skies Friday night combined with no moonlight coming just off the New Moon will make for excellent viewing of the Orionid meteor shower, which should have some lingering streaks of light overhead again Saturday night, too. The Head of the Charles looks wonderful Saturday and Sunday with a light wind that will allow for some great course times from the rowers, while spectators are treated to an incredibly comfortable weekend. Clouds are expected to thicken Monday, but rain is very likely to hold off until either Monday night or Tuesday, then come in fits and starts through the midweek into Thursday, heaviest Tuesday night into Wednesday morning. The early call on next weekend in our Exclusive Early Warning Weather 10-day forecast is for fair weather, but cooler temperatures than this weekend – how could it NOT be cooler than this? !